Purpose: Laparoscopic magnification is great advantage for precise surgery. In this study, complications were assessed after laparoscopic rectal cancer resection, especially autonomic nerve injury. 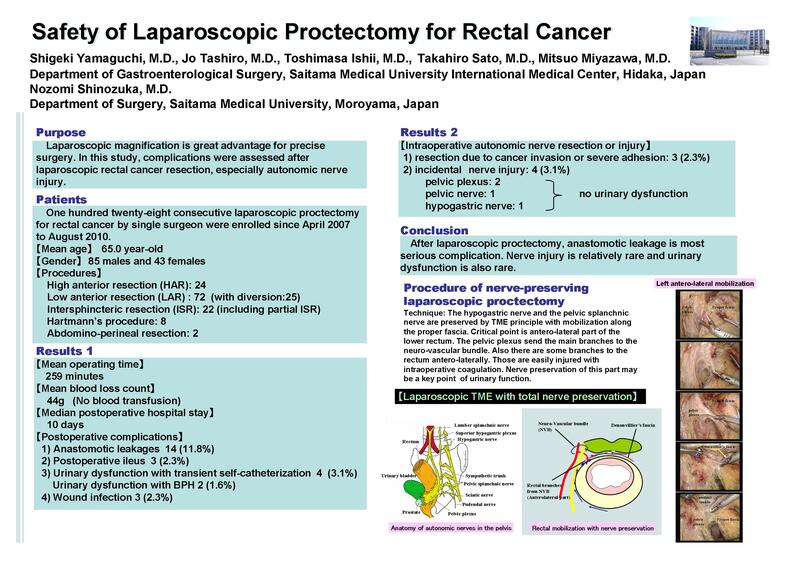 Patients: Consecutive 128 laparoscopic proctectomy by single surgeon were enrolled since 2007 April to 2010 August. Mean age was 65.0 year-old, 85 males and 43 females were included. Procedures were; anterior resection 24, low anterior resection 72 (with diversion 25), intersphincteric resection 22, Hartmann 8, and APR 2. Results: Mean operating time and blood loss count were 259 minutes and 44g, respectively. Median postoperative hospital stay was 10 days. Postoperative complications were; urinary dysfunction 6 (4.7%), ileus 3 (2.3%), and wound infection 3 (2.3%). Anastomotic complications were; leakage 14 (11.8% of anastomosis cases) and bleeding 4. In 6 patients of urinary dysfunction, 2 patients were caused by BPH. Transient self-catheterization was needed in 3 patients for one week to 4 months. Catheterization is still necessary in one patient for 6 weeks after proctectomy. Intraoperative autonomic nerve resection was performed in 3 patients because of large cancer and severe adhesion. Autonomic nerves were incidentally injured in 4 patients of which were; pelvic plexus 2, pervic nerve 1, hypogastric nerve 1. There was no dysuria in those injured patients because the damage was incomplete and unilateral. Conclusion: After laparoscopic proctectomy, anastomotic leakage is most serious complication. Nerve injury is relatively rare and urinary dysfunction is also rare.